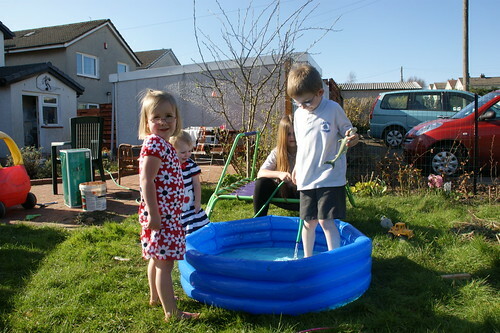 Phyl's Blog: Paddling pool in March... snow in April! Paddling pool in March... snow in April! Paddling pool in March!, a photo by PhylB on Flickr. Well it looks like Scottish weather has nose-dived off a cliff this morning. I'm sitting here in jeans, a long-sleeved t-shirt, and a cardie, with the central heating on. No one (funnily enough) is outside in the paddling pool today because it is currently snowing... Yes it is bloody snowing! There's exactly one week (not to mention 19°C) between these two photos. "These two photos"? I can only see one.